My love of Porsche wasn't at first sight, it was love at first sound! I can clearly remember the day I first heard an air-cooled 911. I was 13 and it was the early 80's. Porsches were definitely not common in my neighborhood and until that day I'd only seen them on posters and TV. The throaty burble of the flat-six immediately grabbed my attention as it rumbled up behind me. At the time, I didn't yet know what it was, but I knew I liked it. Then, as it passed, the driver grabbed another gear, and I was hooked. Who couldn't help but fall in love with those wide hips combined with its siren song? Like it's finely tuned boxer engine, the sound coming from the 911s muffler was powerful. Fast forward to today and Porsche's most recent iteration of the their 911 GT3 is one of their most powerful road going sports cars. Capable of hitting 60 mph in just 3.3 seconds on its way to a top speed of nearly 200 mph the sounds that emanate from its muffler are intoxicatingly powerful. To me, it can tell a story and convey emotion. Packaged properly, as Porsche does, it's a sound that motivates. The 911 Soundbar Porsche Design sent us to review has these same attributes because it uses the actual components from a GT3. It takes the normal function of a GT3 muffler and turns it upside down to resonate sound vs. constrain and control it. Delivering deep bass and a measurably louder audio experience, the 911 Soundbar pushes out your favorite track at 200 watts with no distortion. That's powerful! 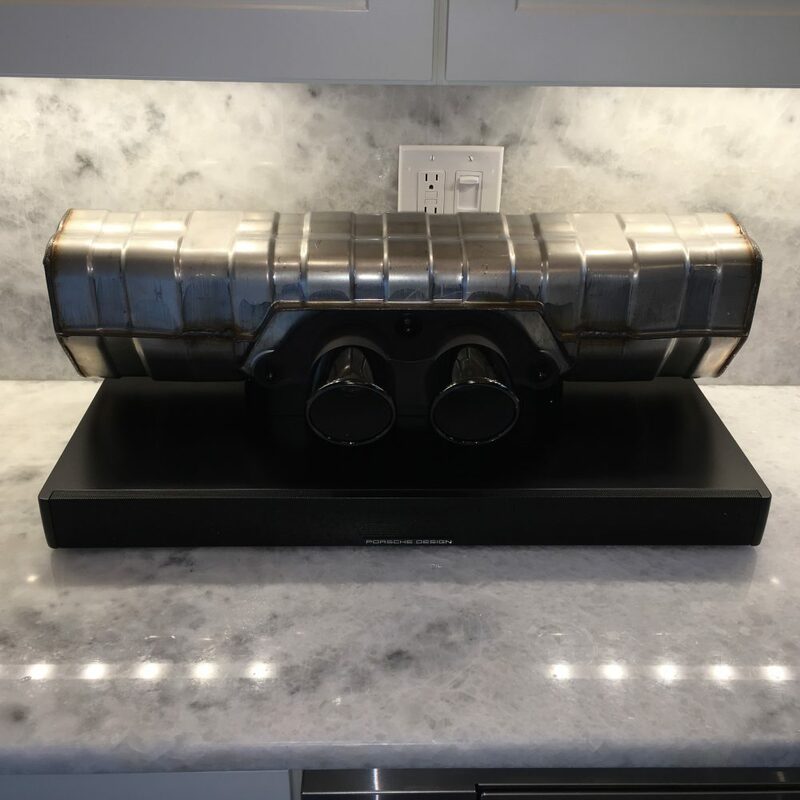 Similar to the Porsche 911 GT3, the muffler plays an essential role in generating sound for the "911 Soundbar". Here, the highlight is the more-or-less reversed functionality of the original parts: unlike a car, the rear section and tailpipes on the "911 Soundbar" are used as resonators. This channels rearward sound to activate air within the muffler’s "pipe system." The result is an extremely high-level of efficacy in the corresponding frequencies. In lieu of the air volume, this translates into a sound threshold, which is deeper, higher, and quantitatively louder. Simply put: "more power." The 911 Soundbar is as impressive to look at as it is to listen to. 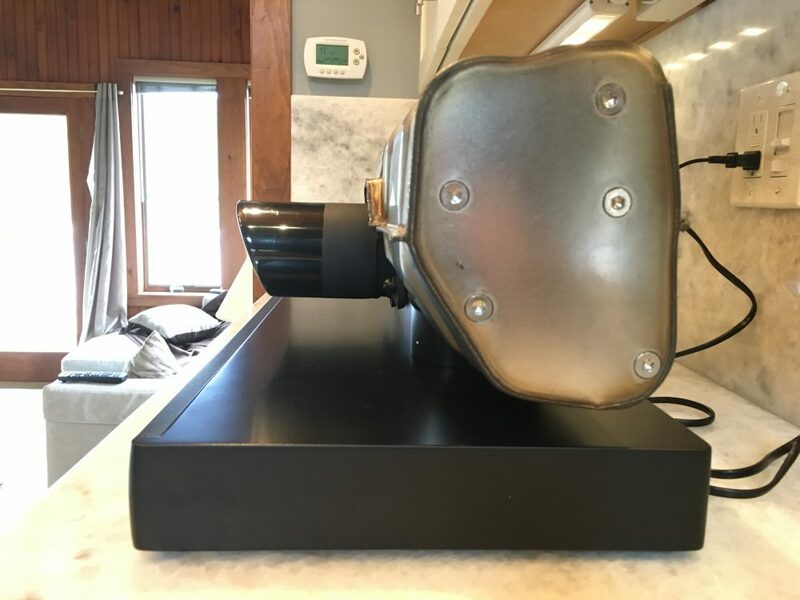 The GT3 muffler sits atop a black monolithic like base that holds the electronics and integrated subwoofer. Setup is a breeze. All you do is attach the supplied power-cord, plug it in, and use the remote to choose your input option. For our test we paired our iPhone using Bluetooth. It took less than 15 seconds overall. 1. Start with an easy track, one that's well recorded and produced to such a high standard that it should sound good even through ear buds. We chose "Get Lucky" from Daft Punk. 2. Next up they suggest something with a wider range. You want to find a song where you can hear the separation between the different instruments and individual vocals. We chose Stevie Ray Vaughan's "Tin Pan Alley". 3. Moving on, you want your music to move you. It needs to convey the emotion the artist intended. If it's an upbeat or fun song, does the sound from the speaker make your foot tap? A little "Walk on the Wild Side" by Lou Reed had our foot moving to the melody pretty quickly. 4. Let's not forget about base. Most soundbars have a separate, powered subwoofer. The Porsche 911 Soundbar's subwoofer is integrated into its base, but it doesn't suffer as a result. In fact it excels. Ce Lo Green's "Bright Lights Bigger City" had the whole house shaking with clean, deep bass and no distortion. 5. Last, but definitely not least, you want to tie it all together. You need a complex song that packs a lot into the track both vocally and musically. Sounds like a job for the Foo Fighters "These Days". The Porsche 911 Soundbar is available exclusively from Porsche Design and is priced at $3500. *Full Disclosure: Porsche Design is a sponsor of FLATSIXES.com and sent us a sample of the 911 Soundbar to review. Unfortunately, despite our begging, we still had to return it. Are you kidding??? $3500 for a Sound Bar. This is a joke for Posers with more money then sense. Total Bull. Everyone’s entitled to an opinion. I know a lot of people who would say the same thing about anyone that spends six figures on on “old” air-cooled Porsche. Even still, thousands of people do just that each year and a lot of them are subscribers to this site. Is there mark-up on the Soundbar for the Porsche name? Definitely. Same way there is for their cars. Doesn’t change how good it looks and sounds and the uniqueness of being made from a real GT3 muffler.